Galway’s Continental Christmas Market, located in the heart of the city is always a national highlight of the festive season. This year the gates will open to the public at 6pm on Friday the 17th of November until the 22nd of December. With an estimated 350,000 people visiting in 2016, Galway’s Christmas market is Ireland’s largest and longest running market in the country. The market, which is located in Galway’s Eyre Square, boasts more than 50 wooden chalets along with Santa’s Grotto and the German Bier Keller. With a range of Christmas favourites on offer from mulled wine and roasted chestnuts to more typical stall favourites like tasty burgers and chocolatey crepes, it’s a foodie’s paradise. 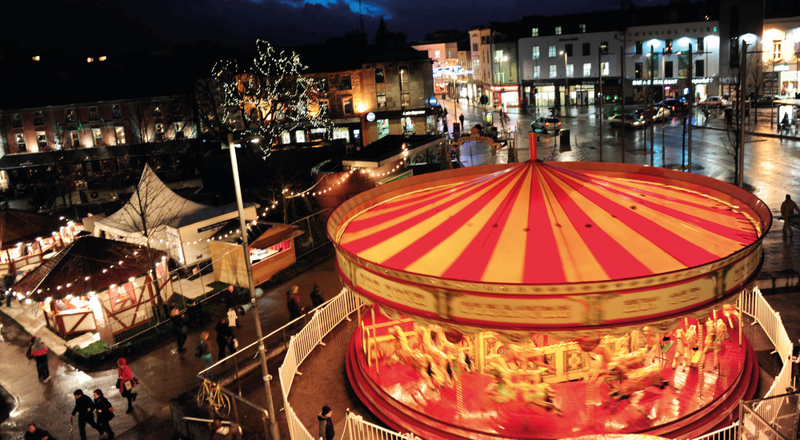 This is Galway’s eighth consecutive year running their Christmas market and visitors are in for a treat this coming year with a lot of new features including amusement rides like the Big wheel, Helter Skelter and the traditional Carousal along with live music performers, puppet shows, storytelling, school choirs, carol singing together with charity and community events will feature. The German Bier Keller tent is known for hosting various events including live music throughout the duration of the market. With something for everyone to enjoy, Galway is the perfect destination to get into the festive mood this Winter.